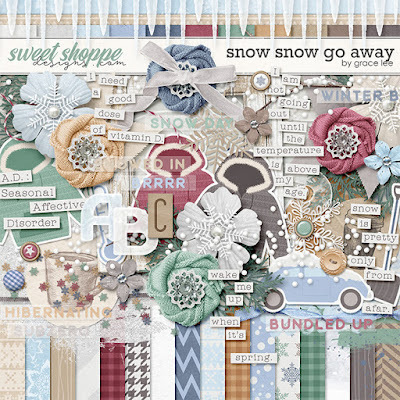 Snow Snow Go Away is designed for this dreary and gray winter days when the best thing to do is to curl up in a warm blanket and scrap. If you're like me, the icy roads and terrible traffic, the freezing temps....bleh! If you or someone you know can't wait for spring to come, this kit is just for you. 56 elements. The elements include 1 bow, 3 brads, 2 branches, 2 buttons, 2 circles, 10 flowers, 1 frame, 3 icicles, 3 foliage, 2 paint, 2 ribbons, 2 scatters, 2 snowflakes, 7 stickers, 1 stick, 12 word art, and 1 wind.